A small, spiky, green tendril creeps across a vertical slab of rock. It looks like a tiny conifer, crawling across the rock. 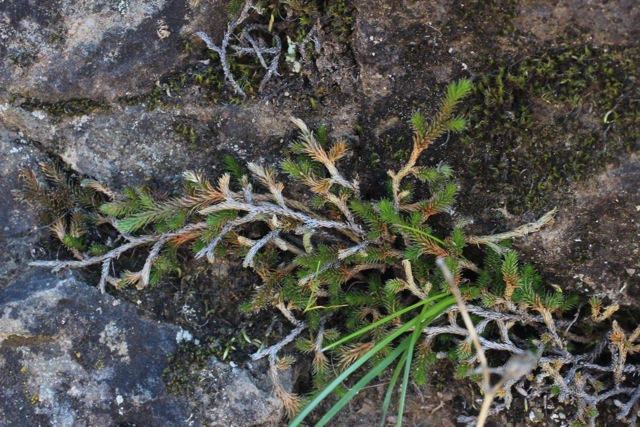 This is Wallace’s spikemoss, or Selaginella wallacei and I was delighted to see it growing near Carson Falls. For reasons I can’t explain, the spikemosses have been one of my favorite types of plants since I first learned about them in my undergraduate botany classes. Selaginella species reproduce via spores, as ferns do. Unlike ferns, the spores are produced from “spore cones” that are often found paired at the tip of the branches. 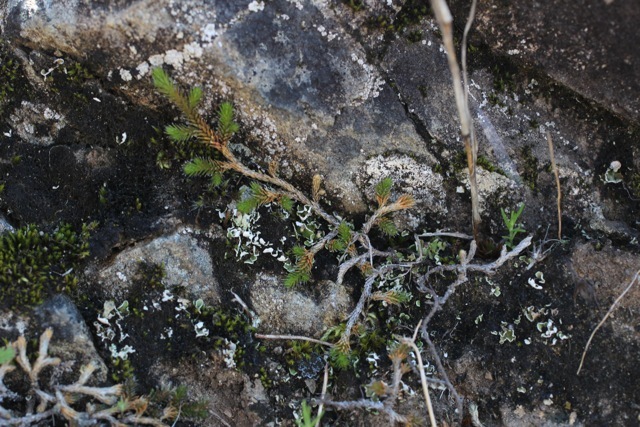 Wallace’s spikemoss likes to grow on rocks. It can form into mats in sunny spots, but it is also found in a sparser form in the shade. It is widespread–throughout Northern California, and north into BC and Montana–but not common. You have to keep your eyes peeled for this little charmer!